Offering a harmonious blend of fitness, nutrition and wellness, PFC Spa FIT delivers a complete mind-body transformation to leave you looking great and feeling even better. Integrated with the world renowned Chopra Center and #1 rated wellness Spa at La Costa, guests of Spa FIT experience exhilarating workouts from PFC’s top trainers, nutrition education and healthy cuisine from top wellness chef, Chef Jason Kieffer. Following daily sweat sessions, the restorative bliss begins with a myriad of natural spa therapies from the Chopra Center, leaving you relaxed, rejuvenated and well on your way to your weight loss goals. Are You Ready to Lose Weight & Keep it Off? With 50 years combined experience of world class training, our extreme weight loss 4+ week program provides an unprecedented experience that has resulted in over 3,000 weight loss success stories around the world. So it is with the utmost conviction I say that attending PFC Fitness was an amazing & enlightening experience! I can not put into words how truly thankful I am that I was lucky enough to be able to go. I found myself again; got my confidence back; learned how, for my body type, I needed to eat & exercise; and most importantly, I learned how to adopt a healthy, sustainable lifestyle, instead of trying to change myself for it. I am healthier mentally & physically & the happiest I have ever been! 0% - $0 Money down. Call now for our Weight Loss pricing. Single/Double Occupancy Rate Starting at 1 Week. If you are not satisfied within 24 hours of our program, we will give you a 100% refund, no questions asked. Yes, I'd like to receive health tips, delicious recipes and exclusive offers from PFC, sign me up! Build strategies, boost confidence and create a positive mindset with the support of internationally-recognized behavior psychologists. Receive at-home coaching with workouts, recipes, and guidance from your PFC team. Reset your metabolism & reshape your body through healthy food choices. Fuel your body with calorie-controlled, delicious meals prepared by renowned chefs. Understand the positive effect of healthy nutrition in all areas of your life through education sessions, cooking classes, food and supplement guidance. Enjoy menu variety personalized for dietary requirements. Rev your metabolism & burn calories without excessive strain on the body. Low impact workouts designed to improve flexibility, strength & posture. Resistance training, aqua, cardio, hiking, yoga, and a variety of over 50 fun activities. It's our mission to provide you with the tools, skills, knowledge and accountability to make healthy choices for life. It's that simple. That's why when you come to PFC Fitness Camp you should expect to have great results. And by results we don't mean just in the short-term, we mean for life. Our program is about lifestyle change, powered by the nations top health experts to ensure you develop the right habits to meet your goals and live a meaningful, healthy and happy life. Located just 30 minutes from the San Diego International Airport, PFC Fitness Camp at Omni La Costa Resort & Spa resides on a 400-acre playground of fitness, adventure and relaxation in the beautiful coastal community of Carlsbad, California. When you arrive at PFC Fitness Camp, your experience starts with a complete fitness assessment that includes blood and flexibility tests, vital signs, body composition testing and more. We believe in the mantra that says, "If you can measure it, you can manage it" and by the time we're done, you'll have a comprehensive understanding of your body inside and out. If results are what you're after, results are what you'll get. Using a systemic approach to training, we maximize your weight loss potential with cardio, resistance training and weight training, teaching you the techniques on how to optimize your heart rate to burn the most calories without wearing out you muscles. Part of our recipe for success is to provide you with the knowledge to make lasting change through daily, interactive education sessions. This includes learning how and when to eat, the specific foods you need to fuel your body and strategies to overcome psychological challenges related to unhealthy eating habits. Working alongside the world's foremost nutritionist to today's top athletes, PFC partnered with Randall R. Grant of Divine Nature to help demystify our client's digestive woes, improve nutritional absorption, metabolism of food and aid in weight loss goals. All PFC packages include a one-on-one health evaluation for a comprehensive look at current eating habits and existing digestive or health issues followed by a personalized health plan. When you come to PFC Fitness you enjoy the benefit of having each of your meals prepared for you by the culinary experts at Omni La Costa Resort & Spa. Recipes are created just for our camp using the freshest foods and ingredients - all perfectly portioned to help you manage your daily caloric intake with ease. Best of all, you'll go home with the recipes and hands-on training to know how to replicate the meals at home. This alone is part of our recipe for long-term success. Recently named the #1 Wellness Spa in the nation by Spa Magazine and Travel + Leisure’s #4 Spa in North America, The Spa at La Costa is committed to improve your life through the healing powers of nature. Awaken your senses with the aromas of fresh citrus and herb elixirs, relax poolside under an umbrella of breathtaking bougainvillea, walk barefoot on Southern California’s only Reflexology Pathway, and choose one of over 30 invigorating spa treatments daily. Your experience at PFC Fitness Camp doesn't end when you say goodbye - in fact, it never actually ends! With our at-home coaching program, you'll always have a piece of PFC with you to encourage you and provide helpful feedback as you transition back to your new, healthy routine. Part of this is formalized to help hold you accountable to a personal coach who is there with you every step of the way. What Makes PFC So Special? From London to Los Angeles and all over the world, PFC has a special way of uniting various cultures, personalities, ages, fitness levels and goals into one very connected family, forming bonds that last far beyond their journey at PFC. 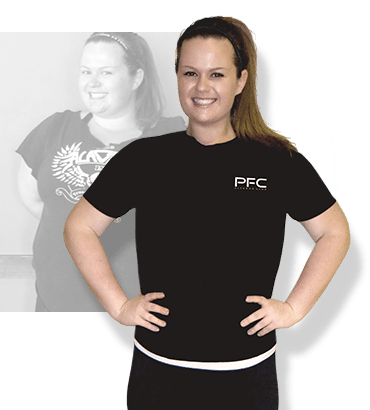 Scroll through the images to see some of the amazing campers that make up our PFC fit fam! Fill out the form to learn more or call to speak to a weight loss specialist today!